Chapels, historical mysteries and a celebrity cat – Rosslyn’s got all the ingredients for a good day trip from Edinburgh. 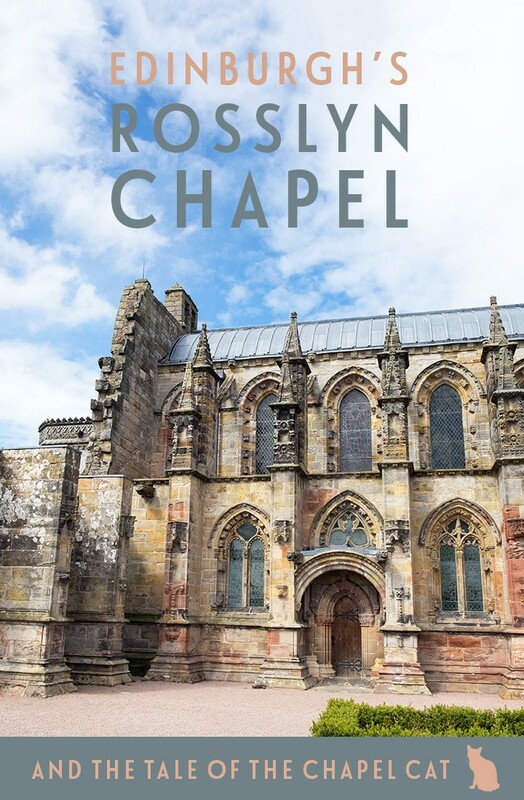 Just a few miles south of the city, Rosslyn (or Roslin)’s main draw is its 15th-century chapel, made famous by a very 20th-century author. 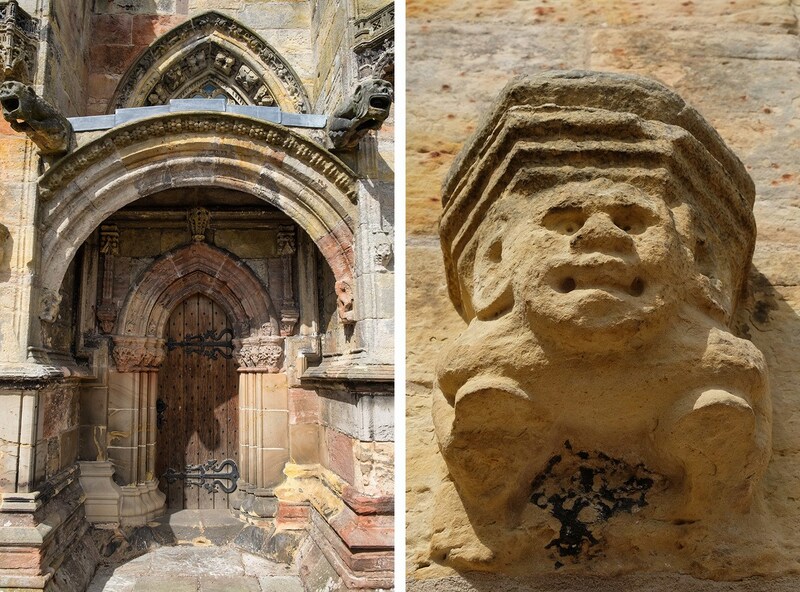 Rosslyn Chapel was the brainchild of nobleman William St Clair of Orkney. He spent his mid 20s exploring Europe and developed an obsession with France’s Gothic cathedrals. 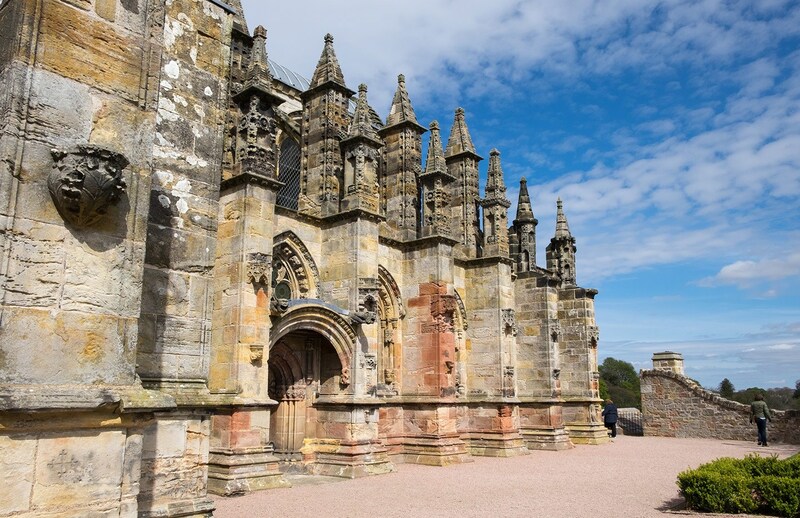 So when he came back to Scotland he decided to build his own – the Collegiate Chapel of St Matthew, aka Rosslyn Chapel. 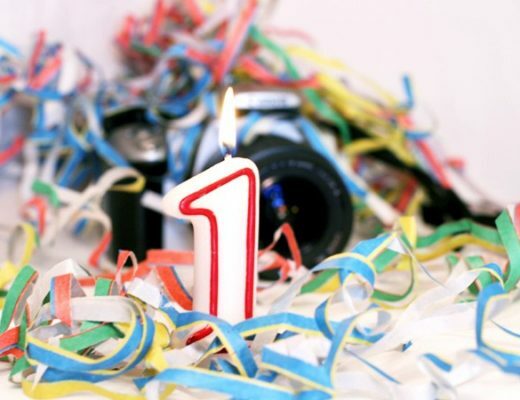 Though his original vision was on a grander scale than what you can see today. It should be 34 metres longer with a giant tower you can see all the way from the centre of Edinburgh. William had plenty of money to fund his plans, and brought an army of master craftsmen from across the UK and beyond to work on his vision. The village of Roslin grew up around the chapel to house them all. But 40 years later work still wasn’t finished on the chapel when William died, so he never got to see his creation fully come to life. Nor did anyone in the end. His son Oliver got the roof finished but abandoned all the grand plans for towers and giant transepts. 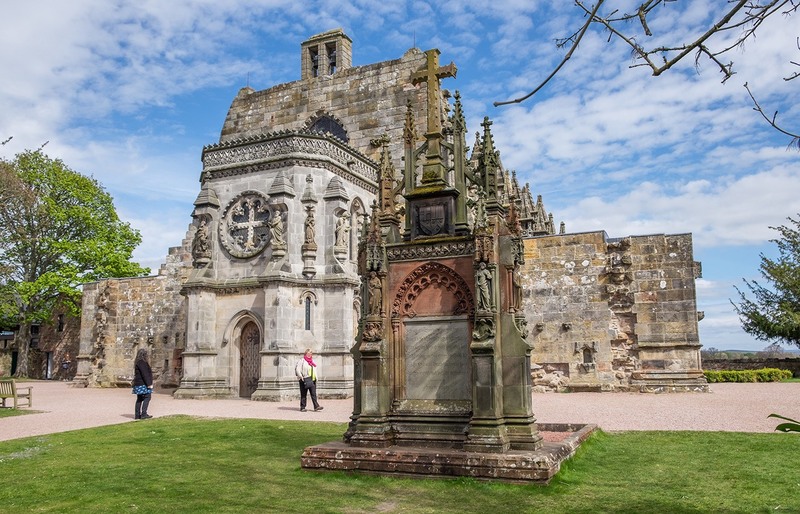 The family were Catholics so during the Scottish Reformation the chapel was damaged and statues were stripped out, leaving it empty and falling into disrepair. The chapel was eventually reopened in the 1860s but years of neglect and Scottish winters had left it in a sorry state. Some of the works to fix the damage only made things worse, so by the late 1990s it was in need of serious TLC. A massive project took place to dry it out, preserve what was left and restore what had been damaged. A huge steel canopy was built right over the top of the chapel to protect the roof while it was repaired and the carvings, stained glass and organ were restored. And now it’s looking as good as ever. Outside there’s honey stone, arched windows and delicate pillars. But inside is even more special. Almost every surface you can see is covered with intricate carvings – stars, flowers, doves, angels and over 100 Green Men (human faces with greenery growing out of them). But some of the most impressive carvings are on the Apprentice Pillar. 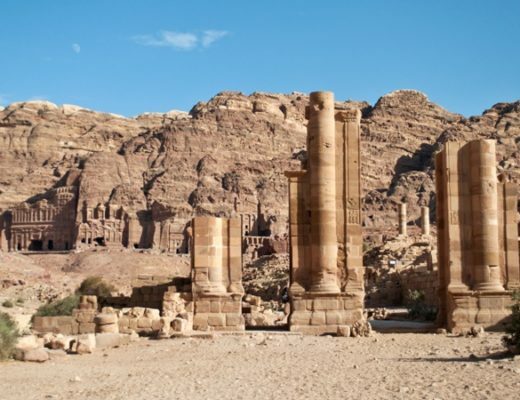 Legend has it the master stonemason went away and his apprentice finished the column. When he came back he flew into a jealous rage and killed the apprentice with a mallet. So in punishment his face was carved into the pillar opposite to stare at his apprentice’s pillar for eternity. That’s not the only legend attached to the chapel either, there are all sorts of stories about its links with Freemasonry and the Knights Templar. Is it built on a mysterious ‘Rose Line’? Or could it be hiding place for the Holy Grail? 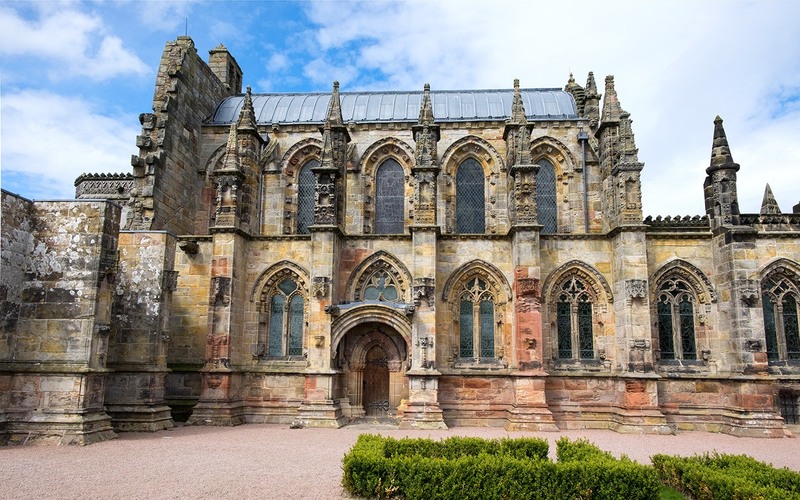 I’m not sure I’m convinced, but Dan Brown was so taken with the chapel and its myths that he made them part of his bestselling book The Da Vinci Code, which started off Rosslyn Chapel’s second renaissance. Visitor numbers spiked from 34,000 to over 176,000 when the film version came out in 2006, and Tom Hanks and Audrey Tatou came to Rosslyn to film part of it in the chapel’s real crypt. But the Hollywood interlopers can’t compete with the chapel’s real star, its resident black and white cat. William – named in honour of the chapel’s founder – moved in as a kitten and hasn’t left since. He’s become a bit of a local celeb and you can buy a cuddly toy and book about his adventures in the chapel gift shop. 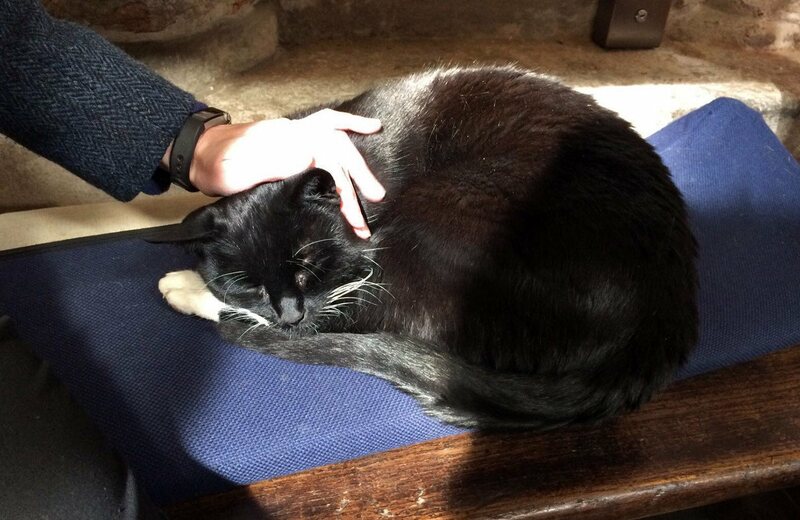 We found him in his favourite spot, snoozing in a sunny patch on the pews and oblivious to the tour going on next to him (he’s heard it all before). He’ll happily accept a few minutes’ fuss from a line of admirers. 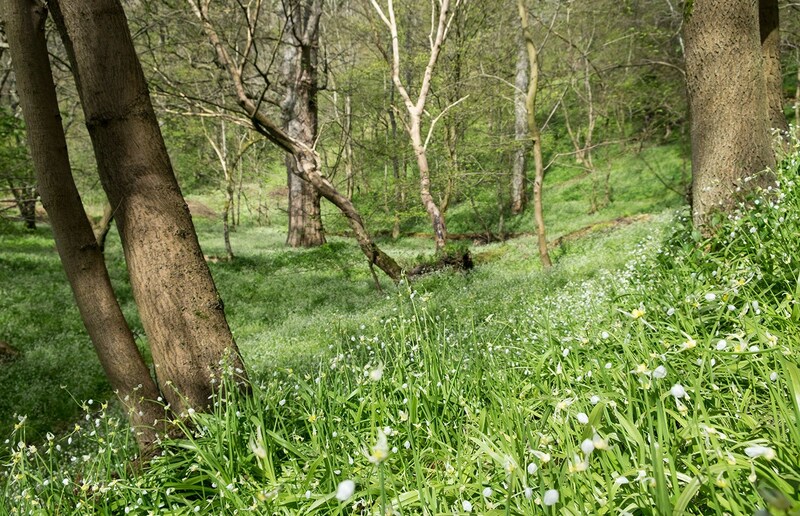 The chapel lies on the edge of Roslin Glen, so after our tour and cat-stroking we headed out for a wander in the woodland. Tucked away among the trees is the ruined Roslin Castle, built by one of William St Clair’s ancestors. 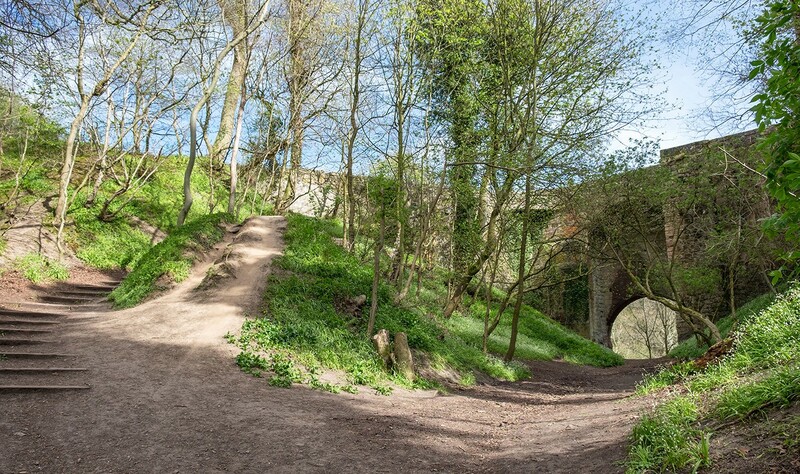 It’s set on a hillside across a tall bridge where the original drawbridge stood. There’s not a lot of the castle left, but of course it has its own legend, of a sleeping lady who’ll wake up one day and reveal a buried treasure and make the castle rise from the ruins. Until then though you can stay in a hidden holiday apartment right next to the ruins. But what I want to know is does it come with its own cat too? 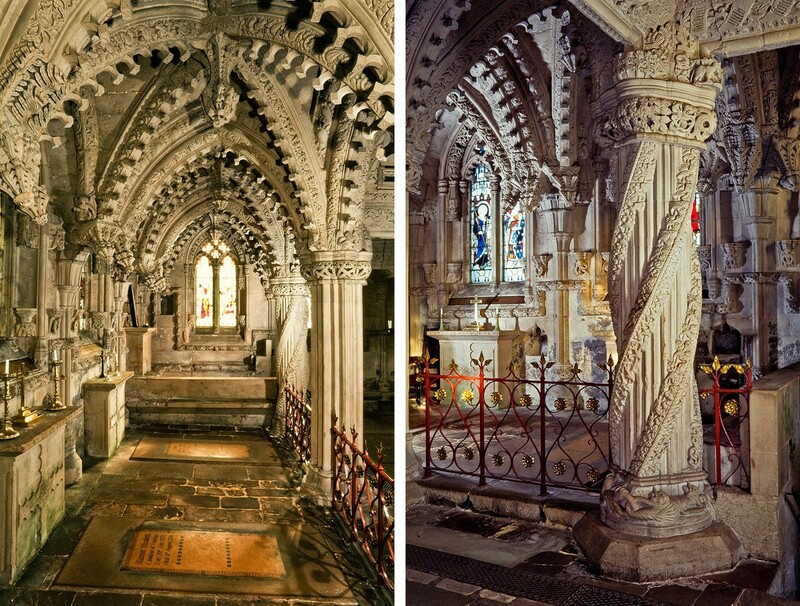 Rosslyn Chapel is located seven miles south of Edinburgh. If you don’t have a car, the 37 bus runs between Edinburgh city centre and Roslin village. The chapel is open from 9.30am–5pm (or until 6pm during June, July and August) on Mondays to Saturdays and from 12pm–4.45pm on Sundays. Entry costs £9 per person (£7 for concessions and free for children under 18 if they’re with a family group). Me too, so many fascinating stories to uncover! Anything cat related I’m right in there too! Mythology and felines – the perfect combination for me (and quite a few others, it seems). Lucy, your recent articles on Edinburgh and the surrounding area are really making me ache to go visit. It’s all so utterly gorgeous and fascinating. It’s rapidly becoming my new favourite city! Such a diverse and beautiful place. Have been dying to get to Scotland ever since watching Outlander. I think it will be so much like the series and dreamy like your post! I’ve not seen Outlander yet but I must! Love visiting Rosslyn Chapel! Some distant cousins actually got married there before the movie made it famous! We snuck through the woods to see the house back there too! Such a good view from there over the bridge. 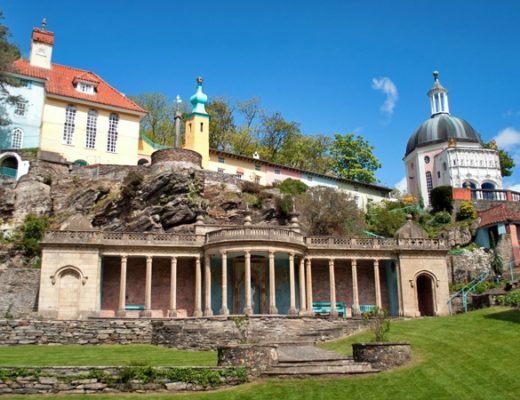 What a lovely spot to get married – sounds perfect!